You know that saying, so bad it’s good? Well, I think that applies here. My wife suggested this movie for the blog. She saw at the drive in with her parents and brother when she was a kid and said it would be perfect for this blog. She was right (as usual). What is Grizzly? Simply it is Jaws with the woods as the ocean and a gigantic Grizzly bear as the shark. Really. I mean it. Almost scene for scene, this is Jaws with a bear, a lower budget, worse script and no Steven Spielberg. 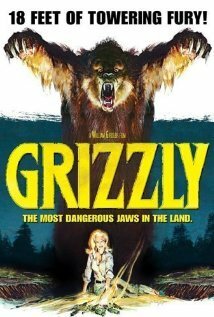 A giant Grizzy (in an area that’s not supposed to have Grizzlies), starts killing and eating campers like they’re going out of style. A park ranger that cares is trumped by his boss that has his own agenda… you know: like mayor of Amity in Jaws. They send out a bunch of random, drunken hunters to hunt down the bear against the wishes of the park ranger – like the fishermen trying to earn the bounty on the shark… In Jaws. It goes on… hell even the music is similar. Low Budget Land Jaws. Now, don’t get me wrong, I liked this movie. Sure it’s dumb but that’s exactly what I expected. This was one of many movies made in an attempt to cash in on the hoopla (yes, I said hoopla), that was created by Jaws. The fact that it was a scene for scene attempt at a copy was just a bonus. Should you watch it? Oh HELL yeah. It’s even easy to do, as I just noticed it is on Youtube, though I’m not sure for how long – check out that link below the clip below. This entry was posted on August 6, 2012 by catfishman. It was filed under Uncategorized and was tagged with b movie, bad movie, copy, crazy, creature, drive in, Grizzly, horror, jaws, movie, silly.